Increasing your database should never involve a mass import of your LinkedIn contacts nor should it involve “scrapping data” from websites. 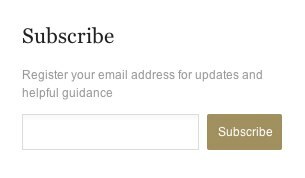 Apart from breaching Irish Data Protection Laws,your subscriber lists now contain email subscribers that have not opted in to receive information from you, nor is your message guaranteed to be well received. Many of our customers worry about database churn and frequently ask how they can increase their databases without diluting the effectiveness of their subscriber base. There are a number of online methods you can be implement easily. 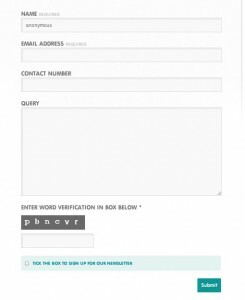 This is a simple space on your site where people can enter their email address. They effectively “opt in” to receive email campaigns from your organisation. Our customers simply add a piece of code that we send them, to their website which enables people to subscribe and the data is then magically saved to their list within “inhouse”, our email marketing system. Suddenly your website becomes a method of data collection – awesome! We’ve used Sheehan and Associates as an example in the image here – it’ll give you an idea of how it could look. We take the view that every visitor to your website should be able to subscribe on every single page of your website. This would generally involve placing the subscribe option in the footer or header of your site. A simple sentence explaining why they should subscribe will encourage sign up. There are many things which will deter someone from opting in, but we’ll saved that for another blog post. If your website has a contact form, you can use it to grow your database. By adding a simple “Tick Box” (and a little code), you give people the opportunity to “Opt in” via your contact form. Again, it’s a simple method of capturing data, adding to your subscriber list growth. Our customers simply add a piece of code to the contact form and when people complete the form, they can tick the box before submitting their enquiry/order etc. In our example below, Here2Help give people the option to receive updates. Depending on your business and your customer profile, a “Pop Up ” can be added to your website and installed in such a way that visitors only see it once and repeat visitors aren’t bothered by it consistently. When the window pops up, it should explain what the benefits of subscribing are. I’ve used John’s Meat Co. as an example. 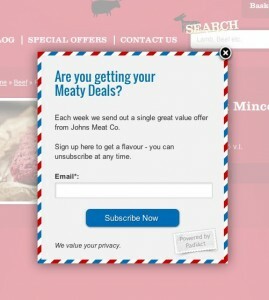 When people click around the site a certain number of times (we set the parameters), a Pop Up will appear asking people to subscribe to John’s “Meaty Deals”….he’s a butcher you see! Not convinced how effective it is? Well, it’s hardly scientific but comparing the number of people who subscribed via the Pop Up versus the number of people who subscribed via the contact form and the Subscribe option on the homepage, the Pop Up saw an extra 52% in the number of subscribers! That’s a massive difference considering it’s via the Pop Up alone! List growth is easy to start with – it’s a constant activity that demands initial investment but it pays dividends in the longer term. You can talk to us about the various options above, even if someone else developed your website. Call us for more tips and guidance.